It's that time of the year again where red, white, and blue outfits are at the top of mind. Sometimes it's nice to be obnoxiously patriotic and other times it's nice to be festive but subtle. I'll call this outfit the latter. Navy and white are a natural combo, but you know I can't resist a pop of color. Charming Charlie previously sent me this bag in yellow (seen here), and I loved it so much, I ended up ordering it in red because it will be perfect for Cardinals games! I posted a flat lay of this outfit on Instagram and said it was red, white, and blue at their finest. It really is though. Yes, I'm most looking forward to having a short work week next week! We have two days of all-day department meetings this week which means early mornings and late nights. They're always fun but super exhausting. So, it will be nice to have a long weekend to look forward to at least! Hope you all had a great weekend! Thanks for stopping by! Great 4th look, I love the bow sandals. You look adorable and how cute is this outfit. These wedges are so good. Really love this, I agree it is subtle patriotic! Super cute blue and white outfit! And really nice, subtle touch with the red bag. I absolutely am loving those adorable bow wedge sandals! This blouse is so pretty and loving those wedges! Perfect look for the holiday and thanks for the link up Carylee! This is such a cute outfit for the 4th! And I just adore those cute wedges. I tend to prefer the more subtle combos too, and this is perfect! Your parties sound so fun. The perfect 4th of July look! Love it! I tend to go with the more subtle outfits too (or at least I think they're subtle)----sometimes I worry about being too costumy! But it's all about the fun, right? Love the shoes especially and have a great time! Lovely outfit Carylee. That firework display sounds amazing. That top is summer perfection! I love it with the pop of red from your bag--subtly patriotic :) I have no idea what we're doing for the 4th, but I need to get it figured out soon! Love this! That top is adorable. I like to be more subtle on the 4th of July. I was commenting on gina's post that I love our flag, but I end up feeling like I'm wearing a costume if I over do it! I like this because it's something you can wear all summer long! Love this outfit! Your shirt is so cute and those wedges (sigh) totally adorable. You look adorable and I love the details in that top. Great look. I have a similar top and love wearing it. Haven't paired it with shorts yet as the weather just got warm enough here to wear them. Enjoy your holiday! 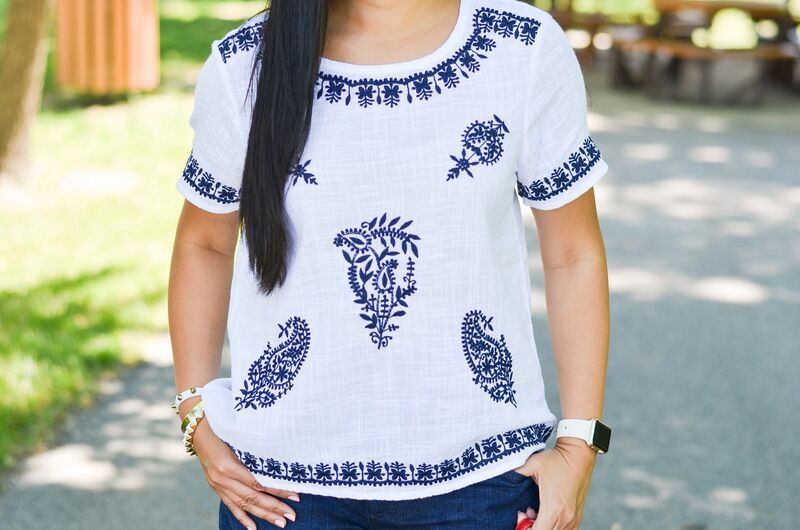 I love this casual chic outfit, the embroidery on that top is gorgeous! You look so fresh and 4th ready! I just posted my 4th essential outfits too, it is only a week away!! 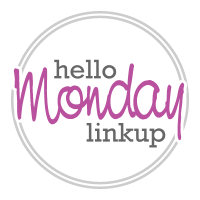 Thank you for hosting the link up, hope you can stop by my first Linkup this Wednesday! Such a great look! I especially love your bow wedges!! Thank you for hosting. 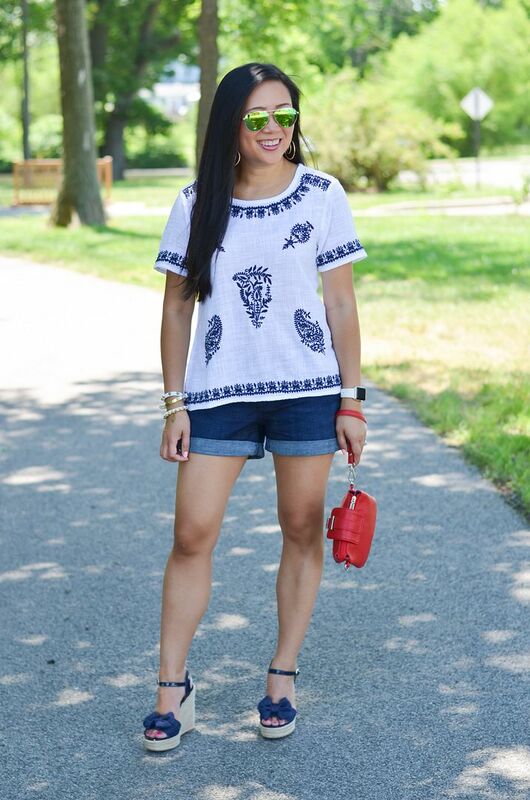 This is the perfect 4th look! Love the blue paisley print!